This is an impressive car. 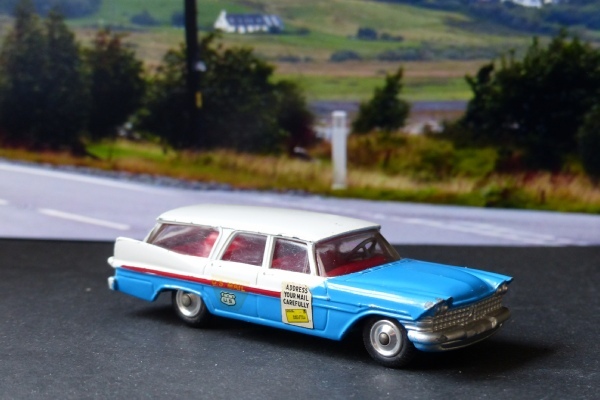 The Plymouth Sports Suburban Estate, or probably Station Wagon as it would have been known across The Pond. It is in great condition and all this model were exactly the same colours and had the same interesting stickers. This and #445 came out in 1963 as suspension versions of #219 which had a nice interior but no suspension. This is one of the last that I have been able to find which was quite a surprise as I hadn’t expected this to be a scarce model at all. I am still looking for the normal saloon with suspension. Neither yet demand very high prices, though, and generally seem to have lasted well from the selection I have seen. This certainly has, looking very fresh and clean. The colours help, I am sure.